What Services Does LaptopMD+ Offer? LaptopMD+ has more to offer than just laptop and computer repair. We also offer iPhone repair, onsite IT support, data recovery, virus removal, and more! Check out our “what we do” page for a full overview or call us at 212-920-4833 and see how we can help you. Can I wait while you do the repair? Yes! Our spacious view of Penn Station from the waiting room allows you to engage in serious thought or escape into a day dream of your choosing. We work hard to make our customers feel at home (or at their office) when they take advantage of our waiting area. While you’re waiting for your repair, feel free to grab a freshly brewed cup of coffee, use our free Wi-Fi or read the latest edition of the New York Times. Also, be sure to play with our TV/Internet enabled coffee table! What type of warranty do you provide on your repair work? We take pride in the work that we do but, just in case something goes wrong with our repair work, our repairs are guaranteed for 30 days. What do you mean by your payment guarantee? If our technicians do not repair or fix your computer, you will not be charged. We promise you that we will only charge you once you have agreed to the price/work to be done and our technicians have performed the work as agreed. The guarantee applies to all repair work that we do – including our hardware, software, and other repair services. How long will it take to repair my laptop or iPhone? Our goal is to get you back up and running as quick as we can. While iPhone repairs are typically done on the spot while you wait, laptops usually need to be dropped off for repair. We strive to perform most repairs within 24 hours of receiving your computer but repair times can vary based on part availability and job complexity. Every job is different, but you will be given a time estimate when you drop your laptop off for a free repair diagnosis. Or simply give us a call ahead of time if you’re more concerned! Who do I contact if I have press/blogging inquiries? You can contact Alex Mouravskiy at press@LaptopMD.com for all press, media, and blogging inquiries. Where can I leave a review/testimonial to share my experience with my friends? LaptopMD+ loves it when our customers share their experience with us. Feel free to leave a review on Yelp, drop us a line at testimonials@LaptopMD.com or visit our reviews page to find a link our profile on other popular review sites. 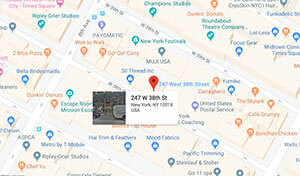 LaptopMD+ is conveniently located at 247 W 38th St #602, in New York City. A block away from Penn Station, LaptopMD+ is easily accessible by all of New York City’s subway lines. Check out our “contact us” page for more details and a descriptive map. How can I connect with you online so I don’t miss out on what you’re doing? You can also join the exclusive Club Medic where you can receive news, promotions, and other special perks from LaptopMD+. Everybody says they’re trustworthy but I’ve learned that’s not always the case - why should I trust you? LaptopMD+ knows that building trust is difficult in the computer repair industry which is why we’re proud to say that we can backup our commitment to trust with more than just words. The people of New York City have voted LaptopMD+ the Best of CitySearch (2008) and the Best of Yelp (2010) through independent reviews and testimonials. LaptopMD+ is accredited by the Better Business Bureau and is backed by Tech Insurance a leading technology insurance company, providing you the customer additional trust and protection. We’ve also been mentioned by several press organizations (local and national) including Wall Street Journal, Inc. Magazine, CNN Money, WPIX 11, and others. Check out all of our certifications, or the reviews page to see what others are saying about us. Seriously, how much are estimates – where’s the fine print? With our free estimates, what you see is what you get. You won’t pay anything until we do the work. It really is as simple as that. We’ll even go further with this promise: If we think the cost of your repair is more than you should be spending on your computer, we’ll tell you! We know technology better than anyone and if we think it’s better to cut your losses and upgrade your computer then we’ll help you make the responsible decision. It’s always your choice but we know our customers like hearing all their options and should you decide to purchase a new computer we’ll be here to help transfer your data from the old machine to the new one. There are no pressure sales at LaptopMD+. We will give you a free diagnosis and tell you everything that is wrong with your computer and how to fix it if you think the price is too high!